Our mini van was struggling. It was so weighed down, I wasn’t sure we were even going to make it up the drive much less 4,000 miles. Country Boy started throwing out all the extra water I had crammed into every crevice as I hollered at him that we needed all the extra water. Tensions were high as we were attempting to pack for 5 people for a 3 week camping trip out West. But you know what? Our 3 week camping trip ended up being our best vacation ever! It really brought us closer as a family. 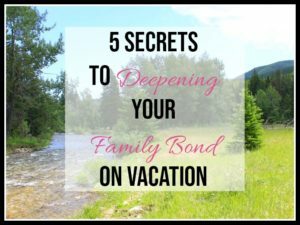 So today I’m sharing 5 secrets to deepening your family bond on vacation! Country Boy and I both love the West. We went out West individually when we were younger. We even chose to go out West for our honeymoon. So spending a trip traveling the West with the family was a dream of ours. When the kids were 16, 12 and 4 we decided that it was now or never. 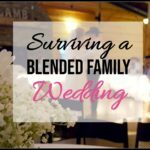 We packed up our older mini van and headed West! As I think back on this vacation there are several factors that made it such a unique trip. Like most of our vacations it was fun, but this trip also brought us closer and connected us more as a family. What made the difference? 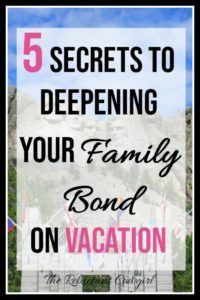 Here are 5 secrets to deepening your family bond on vacation. Plus I’m sharing, from our camping experience, a few tools you will want to have on hand for your vacation. The biggest difference with this vacation was the amount of time we were gone. We had never taken a trip for 3 whole weeks. After the end of the first week, it finally hit that we were going to be gone for almost a month. And it felt great. It takes so much effort to get out the door for a trip, any trip. Everyone has to get packed, shopping done, bills all paid and scheduled, laundry done, house cleaned (I can’t go without cleaning my house first), animals cared for and food prepped and packed. 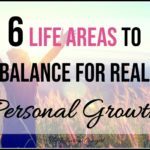 By time you make it out the door, you are typically exhausted. Yes! 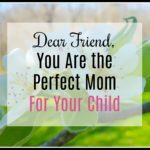 I Want a Great Summer with My Teen! Send the Printable "Summer Contract for Teens." A longer vacation allows for time to actually slip into vacation mode. So if I had to choose between an a slightly more luxurious 3 day vacation versus a 7 day economical trip, choose the longer one if you really want to slow down and connect. Read 10 healthy habits that strengthen your family bond here. There is something special about all experiencing something new together. Even the places I was less excited about, were more interesting because we were all seeing them together for the first time. As you take in all the sites bring along a camera remote! We purchased a remote for our camera so we could take lots of family photos, even in high traffic view points. We would get ready and as soon as we were ready just a click of the button and we had amazing photos! It made photo time way more fun and less stressful! Now, I have to be honest that I was a little nervous about going to all these new places. While I love adventure, I am not exactly spontaneous and free-spirited. But all the sites, except for one, that we visited were amazing. The only snafu was the “cabins” in the Big Horn Mountains. After almost a week camping in a tent in South Dakota I had been looking forward to staying inside a cabin in Wyoming in the Big Horn Mountains. Just for your future happiness whenever someone attaches the word “hunting or sport” to the word cabin watch out!! These cabins were dark, dingy and not fit for man or beast! 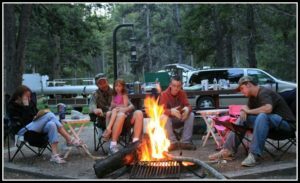 Since we were camping and none of us had smart phones yet it was pretty easy to just enjoy the time talking or reading. Every evening we had a fire and would tell stories and laugh. Even on the trip out, our oldest boy interacted with our youngest reading to her and keeping her happy! Little Red’s favorite book at the time was a book where you counted all the princesses and fairies! What an older brother will do for his little sister! 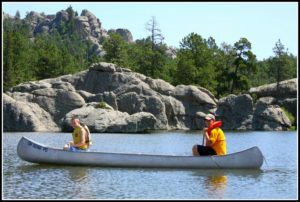 My husband also had this grand idea of dragging canoes all the way out West with us. I thought it was a terrible idea. But I was proven wrong….though I do want to say I was right about needing all the water!! 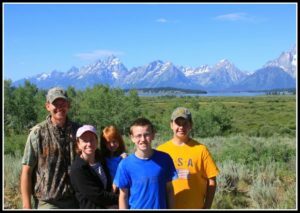 We all had an adventure riding down the Snake River in Wyoming on our canoes and paddling across Yellowstone Lake. The canoes allowed us to just enjoy the parks from another advantage point soaking in the experience. As with any trip there were some things that didn’t go quite as planned. But even the struggles bonded us as a family. We managed to laugh about some of the difficulties even in the midst of them. First, there was the Heat Wave of 2011. Remember all the water we left behind? We bought it all back in South Dakota at double the price along with a truckload of ice to keep all our meat from spoiling. It was like 100 degrees. But fortunately, the place we camped at had access to a beautiful clear lake! That shining lake became even more spectacular as we spent most of the day cooling off in it. Then there was the Feast of Yellowstone. I’m a saver, and Country Boy likes to have plenty of food on hand (in case family or friends stop by:). So I packed enough food that we only ate out a handful of time the 3 weeks we were gone. Which is great…until we arrived in Yellowstone National Park. When we got to Yellowstone we discovered we had to fit all our food and any items that had touched food into our van, due to the bears. We had so much food packed in a huge black camping box on our trailer. There was no way it was all going to fit in our van. So we did what any normal family would do. We had a huge cook-out! We grilled and fed ourselves and any neighboring campers that were hungry!! 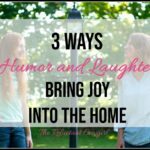 Things are not going to go smoothly so try to laugh or see the positives to the situation. Since it takes so much to unpack and set up tents we had decided to stay no less than 3 nights in each location. And that made for such a more relaxed trip. We had plenty of time to take in some of the sights while still have time to just relax. I highly recommend if you are taking a longer trip to go for quality rather than quantity. Pick a few of the places to see that you are really interested in visiting and still allow for time to just slow down. Discover what every teen craves from their parents here. Slow mornings were also made more wonderful with a coffee percolator for morning coffee! We bought a percolator right before we left and it was THE best investment! Fresh coffee by the morning campfire…civilized life! Do you take trips or vacations as a family? What has been your favorite vacation so far? What made the trip special? Comment below:) Anyone else clean their house too before they can leave?? Great post. And very timely too. We are going camping for 10 days next weekend. And it always seems like something goes wrong. I’m trying to mentally prepare for that! Oh you all are going to have some great times!! Your kids are at such a perfect age for taking trips. 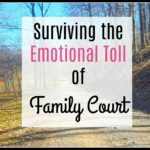 I know camping trips mean a lot of work and prep, but they do seem to be the trips our kids enjoyed and remember the most. Enjoy! Great post! I’m a new mom, so looking forward to family vacations like these! Thanks! Enjoy your little one! Oh my goodness! I remember the trip out west and all your family’s adventures! It truly was a trip of a lifetime, wasn’t it? We’ve been able to get some pretty awesome pics with our camera remote too:) Love seeing the pictures of your three when they were so young! I am so glad of all the pictures we took. It is so lovely to look back and remember when the kids were younger!